Tidewater Insulators, part of the Installed Building Products (IBP) family of companies, serves homeowners and builders in Norfolk, VA and the surrounding areas. We offer insulation, gutter, air sealing and shower door services throughout the area for residential projects. Get a FREE QUOTE for your home services in the southeastern Virginia area today by giving us a call at 757-828-0024 or filling out a contact form! For over a decade, Tidewater Insulators has been insulating homes throughout the southeastern Virginia area. 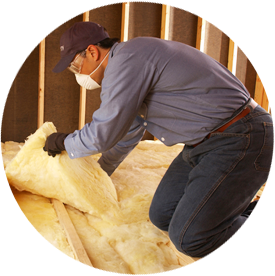 Whether you want fiberglass, cellulose or foam insulation, we can insulate your home so you can start saving money and living more comfortably! Home energy audits. These home assessments will consist of a complete home evaluation and areas where your efficiency can be improved. Some of the things on the list may include insulation, ductwork, windows, doors, and more. Air sealing. When air is escaping and entering your home, you are basically throwing money out the window (or attic or doors or wherever the leaks are happening). The efficiency experts at Tidewater Insulators can seal up your home to help you save energy and improve comfort. Although the bathroom is an essential room in your home where form should follow function, it can still be truly beautiful. You should be able to have the bathroom you’ve always wanted, including the shower—one of the most important elements in a bathroom! Tidewater Insulators offers a large assortment of shower doors, from the basic sliding door to more complex custom designs. Our shower doors are manufactured with high-quality materials, helping ensure easy maintenance with years of beauty and reliability. Do you need insulation, gutter, or efficiency services for your home or business in the southeastern Virginia area? Call the experts at Tidewater Insulators. We can handle all of your residential energy efficiency, gutter, and insulation services! Contact us online or by phone at 757-828-0024 to learn more!